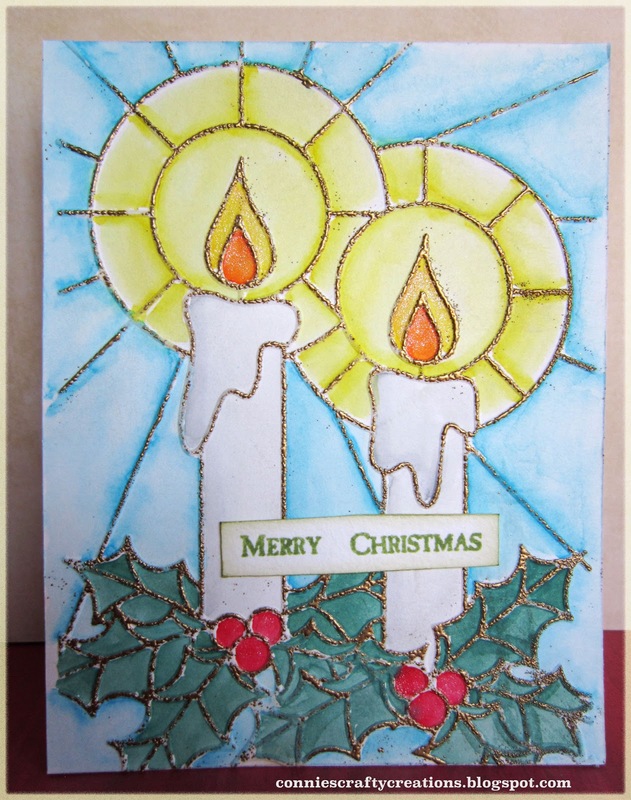 Hi, Connie here with you today using an embossing folder. I love the look of stained glass and when I saw the line of Mosaic Embossing folders in the Dies R us store I just had to give them a try, and what better time than Christmas. Today I am using Darcie Mosaic Candle. I used watercolor paper on both of these cards and it embossed very well, water colored with my distress inks and Spectrum Aqua markers. 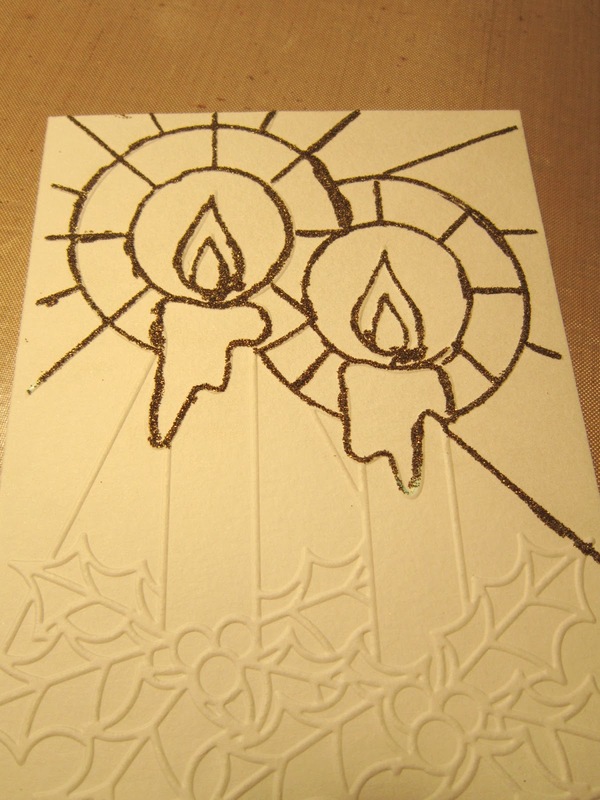 On this first card I used an embossing pen to the raised areas, I did half the card and then turned it and did the other half. As you can see in the picture below I went a little off the embossing, You need to just take a paint brush and just lift the embossing powder off the areas that you went to far. 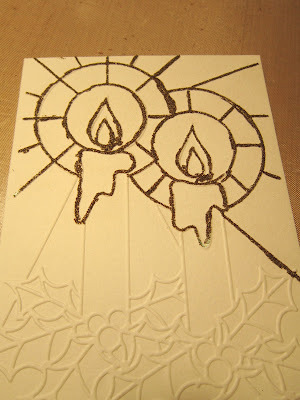 In my second card I decided to use my embossing ink pad so you can see the different look I got from doing it that way. Big Tip for you though when doing this, I used my anti static pad on the first one but forgot when I used my ink pad and the embossing powder stuck to the whole card, I am not sure if that was because I was using watercolor paper or not, so I just took my brush cleaned off the entire piece and started again by using the anti static pad and applied the embossing ink and it worked fine the second time. I have heard if you don't have an anti static pad that people have rubbed a dryer sheet over it or used baby powder. With this one I decided to go with blue in the background. Once it was dry I did add some shimmer to the candles and the berries using my Sparkle clear pen. 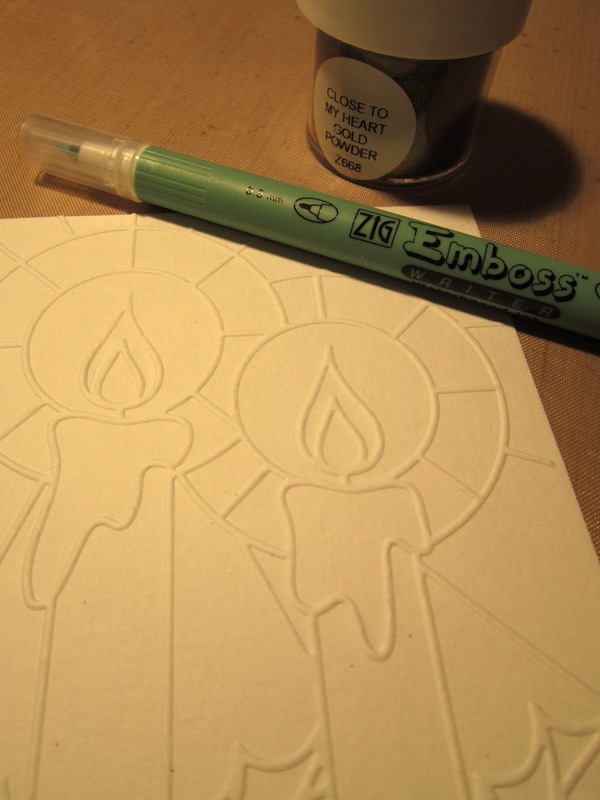 Here is the embossing folder I used, check out all the embossing folders they have HERE. 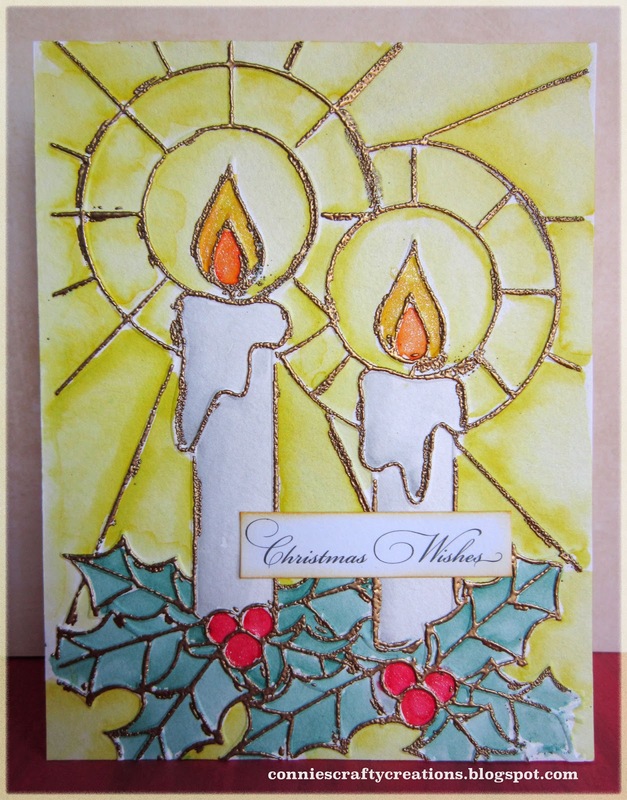 Another fast and mailable idea for your Christmas card giving this season. What a beautiful embossing folder Connie, your cards are so festive. I love w way you have coloured them, they really do look like stained glass windows! Gorgeous creation Connie and awesome tips! Thanks for sharing wonderful inspiration! Great technique with the embossing pen; your cards turned out beautifully. They really do look like stained glass. 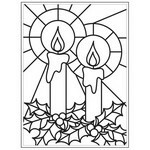 I actually make stained glass and your card is AMAZING!!! I love the look and the embossed images your used. VERY creative and oh so beautiful!!! Love this! Wow Connie, this is so beautiful. Just love your technique with the embossing for the stain glass. Thank you so much for the inspiration. Connie your card is beautiful. I love the look you achieved. Just gorgeous. Wow Connie, these are both so gorgeous!! I love the gold embossing. Your water coloring is beautiful too. Simply gorgeous stained glass!! An absolutely gorgeous card! every detail is perfect!